Introduction: Recently we identified markers in exhaled breath discriminating patients with chronic obstructive pulmonary disease (COPD) from healthy controls using real-time mass spectrometry. The aim of this study was to validate the previously found disease specific metabolic profile of COPD in an independent cohort of patients suffering from chronic obstructive lung disease, i.e. COPD, asthma, or healthy controls using real-time mass spectrometry (validation study). Method: On-line breath analysis was performed in patients suffering from COPD or asthma as well as in healthy subjects, using secondary electrospray ionization-high resolution mass spectrometry (SESI-HRMS). The previously reported COPD specific mass spectrometric markers were then analysed in this new cohort with respect to their statistical significance and classification performance. Results: Breath analysis was performed in a total of 133 subjects (COPD n=49, asthma n=31, healthy controls n=53). Using this bigger, independent, more heterogeneous cohort, we were able to reproduce and validate our previous findings. 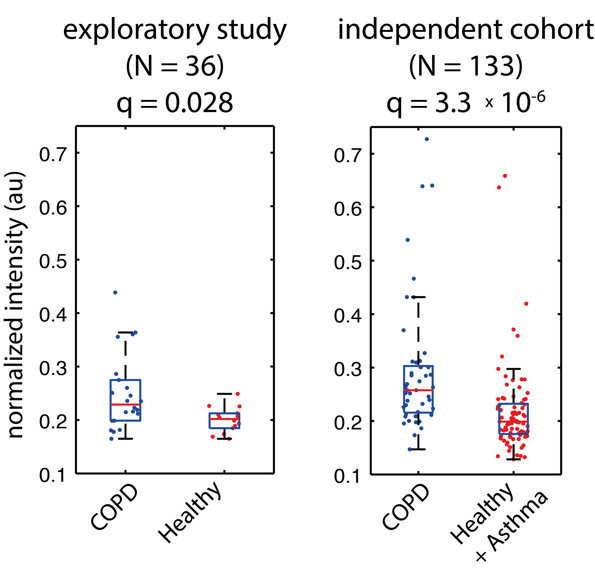 Many of the COPD specific markers that were reported in the previous study were also significantly altered in this new dataset (figure 1) and allowed for discrimination between COPD patients and asthma/healthy controls. We thereby could obtain additional information about which biomarkers are the most robust in this heterogeneous group of subjects. Conclusions: These preliminary results confirm our recent finding that breath analysis by real-time mass spectrometry allows the identification of mass-spectral features discriminating COPD patients from an independent cohort of asthmatics and healthy controls with good accuracy. Untargeted real-time mass spectrometry is a powerful and easily applicable method for the diagnosis of COPD. Figure 1: Boxplots of the average intensities of the mass spectral feature of exhaled breath at 201.0702 Da in positive mode, for the old (left) and new (right) cohort. Besides others, this compound was recently reported as a putative biomarker for COPD. In the old cohort (22 COPD vs. 14 controls) this compound was significantly increased in COPD patients, which was also true for the new independent cohort of 49 COPD patients, 31 asthma patients and 53 healthy controls.